I'm sorry to say that palladium, rare in nature, is not a popular vehicle in which to invest. Palladium is mostly used by the auto industry and other industrial palladium facilities. The prices are determined mainly by these, not by investors. 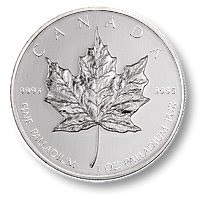 However, we're lucky that we can buy palladium coins and palladium bars, thanks to the Canadian and Chinese government mints. 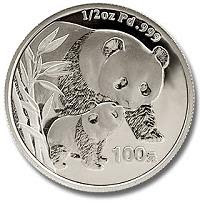 Palladium coins are also minted in Russia, the Russian ballerina palladium. 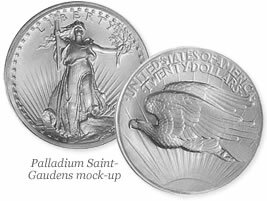 If a US bill passes though the senate, we'll have a US St. Gaudens palladium coin! See related article: Palladium St. Gaudens coin. Those are what we have in palladium coins from our governments. Invest in palladium is possible though Pamp Swiss or Stillwater. They both make palladium bullion in the form of palladium bars. 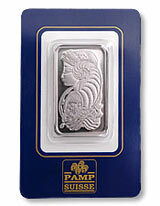 The bars palladium are usually 1 oz, but Pamp makes 10 oz bars too. 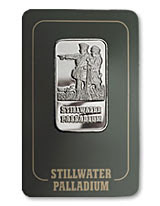 Stillwater Palladium makes palladium bullions coins as well. Let's look at all of these. Where Can I Buy Palladium Online? These are the sites I've used. I'll simply post the links. Keep in mind that some have a $1000 minimum, so for right now you'd have to buy 4-5 ounces of palladium to meet that requirement. Some have a 10 oz minimum. All mark up the spot price 10-20%. Where to Buy Palladium Locally? Here's a little trick. We all have pawn shops around town and throughout our state. I know you have the Internet, so you have the phone numbers of all those places. Call them up! See what they have. They may have just got some palladium bars in today! Quarter Gram Palladium. How Cute! Auto-Bailout to Make Platinum & Palladium Rise?